For the 169 Women Series, I asked over 200 women to give me imprints of their faces using an oil-based makeup remover to transfer the grime and makeup from their faces to cloth. 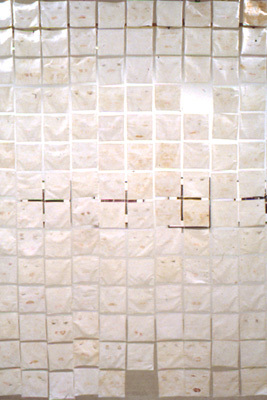 Three imprints each from the 165 women who participated are incorporated into three separate hangings, showing a gradual deterioration in clarity of imprint. Each hanging follows a different organizing principle, documented on its back. Date stamps on the back of 169 Women Received trace how the piece grew as I sought and received imprints from various women. 169 Women Remembered is organized based on my subjective analysis of each woman's relationship to other women in the group. I myself made eight sets of imprints, and they form the center of eight social spheres, such as my family, my husband's family, childhood friends, fellow artists, colleagues at my day job, etc. 169 Women Catalogued stratifies women according to their age when they returned their imprints to me. The order is reflected in a numbering system that imitates the Dewey decimal system.